TrackDay Pro Track Editor | FTLapps, Inc. 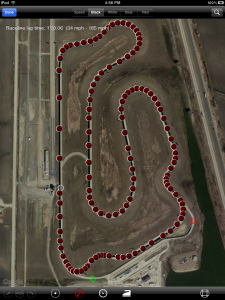 Thanks to Google Maps and the satellite imagery available to the iPad and iPhone, the TrackDay Pro app makes it easy to accurately lay out the raceline for most tracks around the world. Touch the “Create” button in the top-left corner to start the creation process from scratch. 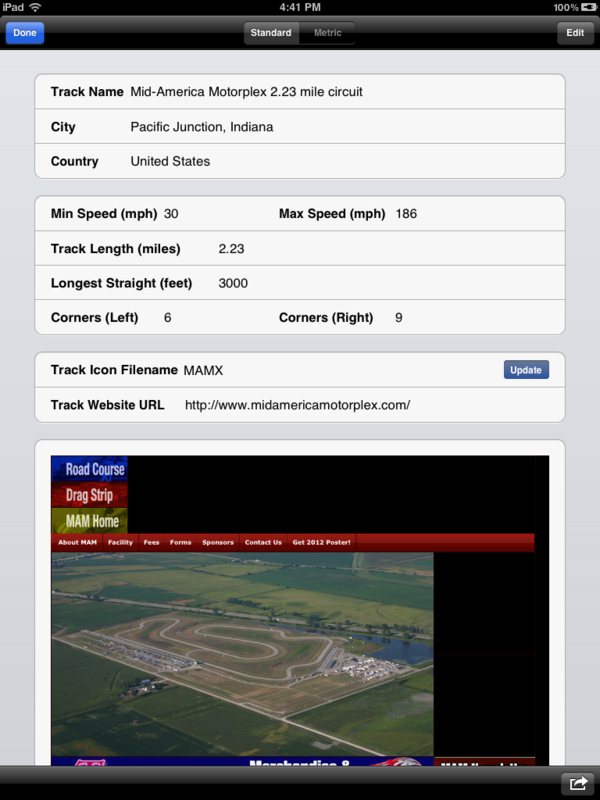 Select an existing track, and touch “Edit” button in the top-right corner to modify an existing track. Select a track from the “Track Store” list: If it’s marked as “Coming Soon” on the Track Store product screen, then a “Create” button will be available on the top-right corner. Touch this “Create” button to just to the Track Editor’s Info screen, and expand on the track definition already provided. 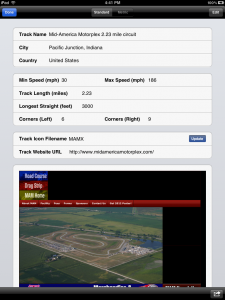 Some of this information will be readily available on the track’s website. Other pieces may found be on wikipedia or trackpedia. Still others must be determined manually or approximated. In most cases, the track will be immediately shown. 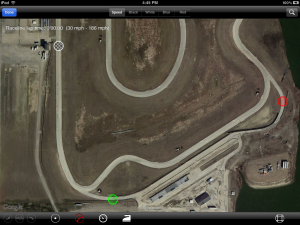 In just a few cases, use of the more extensive search capability in the Maps app may be necessary to find the track. And, in a very few cases (typically less than one out of twenty) the track is not yet visible in the satellite imagery. 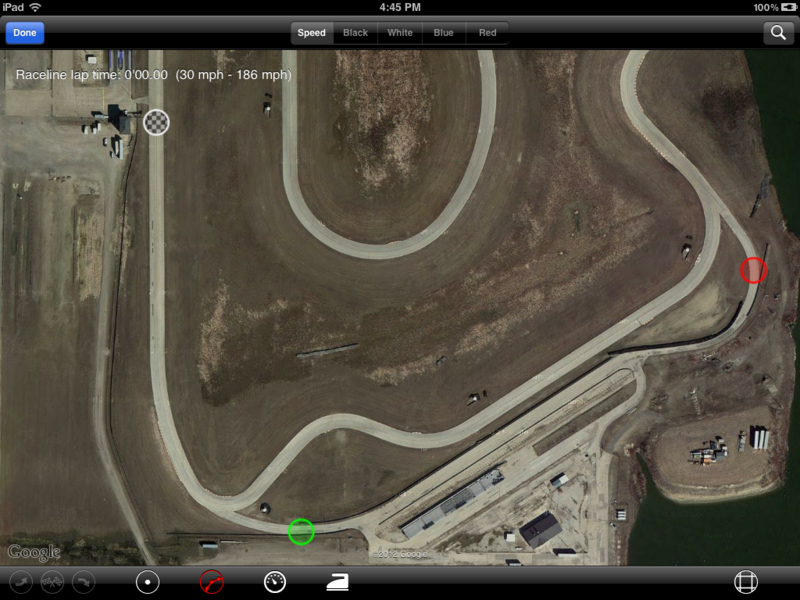 If you can find the track in the Maps app or on Google Maps, you’ll be able to find it in TrackDay Pro. If searching for the track name doesn’t work, try searching for the city, and use the Maps app and Google Maps to track down the exact location. This will lock in the north, south, east and west coordinates for the track. 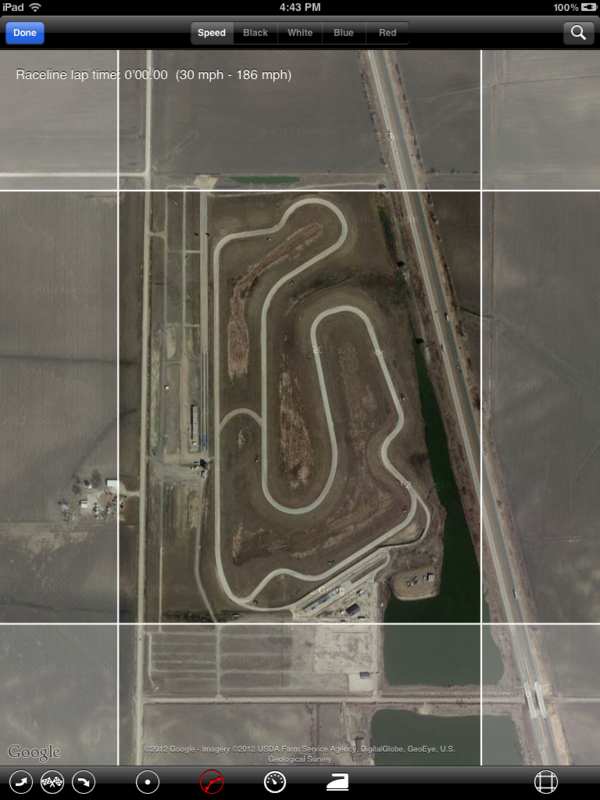 Although you can work in any order, we like to start by specifying the track features: Pit Out, Start-Finish and Pit In corresponding to the buttons on the bottom left. Once these features have been set, they can be selected, repositioned and resized as needed. Keeping the Pit In and Pit Out features away from the raceline, large enough to ensure crossings from the pit area, but small enough to avoid being overrun by errant GPS samples is a bit of an art. It’s better to err on the default size or a bit smaller, rather than making the Pit In and Pit Out features larger — the apps can function without Pit In and Pit Out crossings, but in the 1.0 and 1.1 releases, will be confused by GPS samples that stray off the track causing invalid pit-in or pit-out in the middle of the lap. 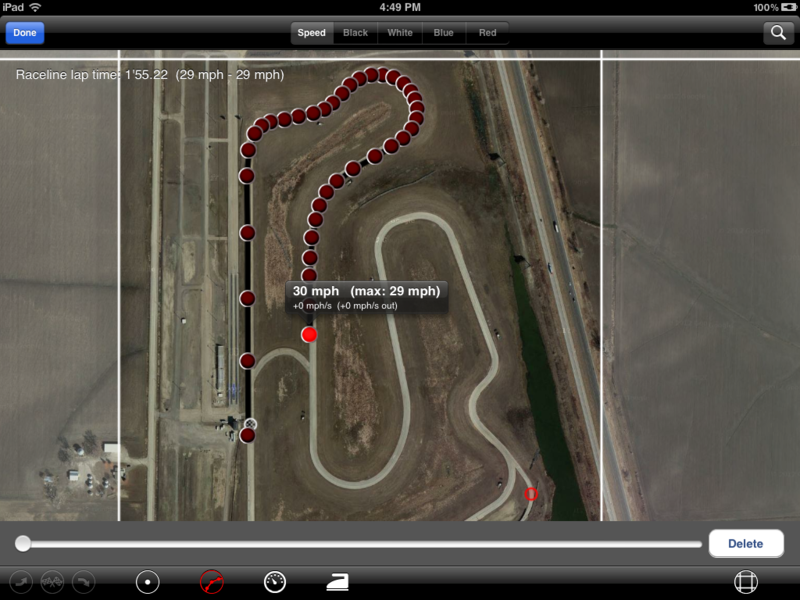 That said, in the particular example shown above, the Pit In and Pit Out features could be significantly larger given the distance from the track, and ability to position out of the path of the curve (in the absence of a clear signal, the iPhone GPS data will tend to follow the last known trajectory, and will veer wildly out of the corners before returning to the next valid GPS sample on or near the track). We then begin plotting the raceline. By convention, we start just behind the start-finish feature. But, any place on the track will work. The editor will automatically close the loop when then last raceline point is within 50 meters of the first raceline point. 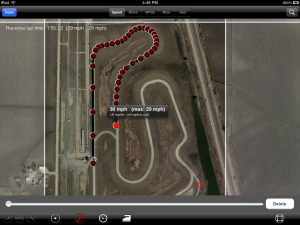 Accuracy of the raceline will not affect the app performance, which currently uses the raceline to clamp the GPS data to ensure accurate start-finish crossings. 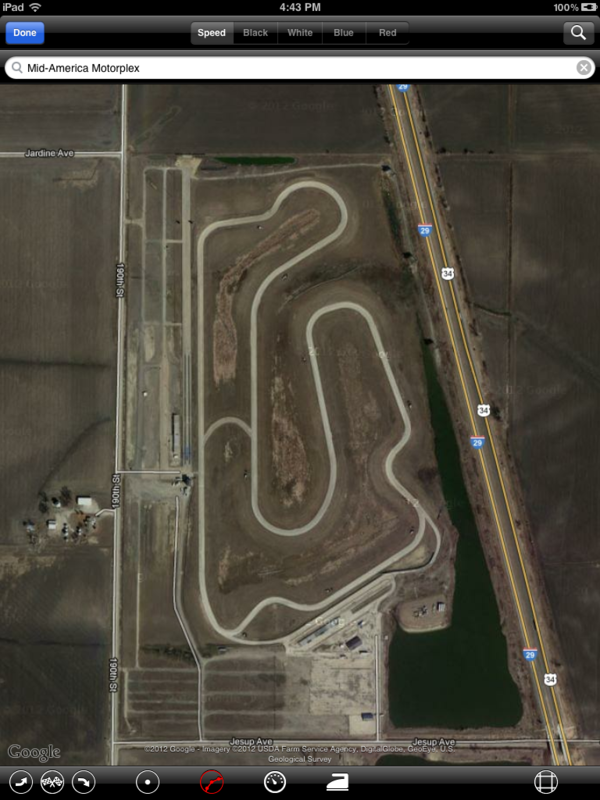 But, a smooth raceline will produce a more accurate estimate of the optimum lap time — typically an “Advanced” pace. Depending on the top speed configured on the Options screen (used in calculating the maximum pace around the track, the auto-computed speeds can produce lap speeds that are a near-perfect match for race pace and top lap records on the track. Once you’ve plotted points around the full circuit, you’ll be ready for the next stage of the process. You can insert points on the raceline at any point. Keeping the raceline smooth is more important than having a lot of points. That is, the turns can be specified with only a few points as long as those few points are very evenly spaced, and positioned to define a smooth radius. The next step in the process will help with tuning the shape of raceline. Toggle the raceline control points off with the “Control Points” button to the left, and you’ll get a view of just the raceline speed coloration. Then, a touch of the “Speedometer” button will auto-generate speeds for every point on the raceline based on the radius at every point. The maximum speed used initially is the speed you set on the Options screen; in the 1.0 release, the default is 130 mph; in the 1.1 release the default is 125 mph. For a raceline designed for liter bikes, you will find that a speed of 186 mph produces the best result. Regardless of what maximum speed you choose, the result produced by this button will show you how smoothly you have laid out the raceline. An optimum raceline is produced in two ways: First, you’ll want to zoom in as close as the available satellite imagery will allow, and tune the points to follow a smooth curve for each turn; from the entry point, through the apex, and wide to the exit point, allowing for late braking and maximum acceleration, into and out of each turn. Second, you’ll want to maximize the amount of “red” raceline (max speed),and ensure smooth transitions into curves of blue or light blue (minimum speed), maintain a relatively constant or slightly increasing speed through the longer turns, and smooth transitions out of the curves. With well-placed control points, you’ll see red, orange, yellow, green, blue transitions into the turns, and blue, green, yellow, orange, red transitions out of the turns. It’s not essential that all colors be represented, but the change in speed should clearly correspond to what’s supposed to be happening at that point in the turn or it means that the control point is somewhat out of place and needs to be moved just a bit. Small changes can result in significant improvements in the maximum possible speed for each point on the raceline. If you’d rather just rough in the track, and have us take care of the detail work, you can just skip ahead from here! 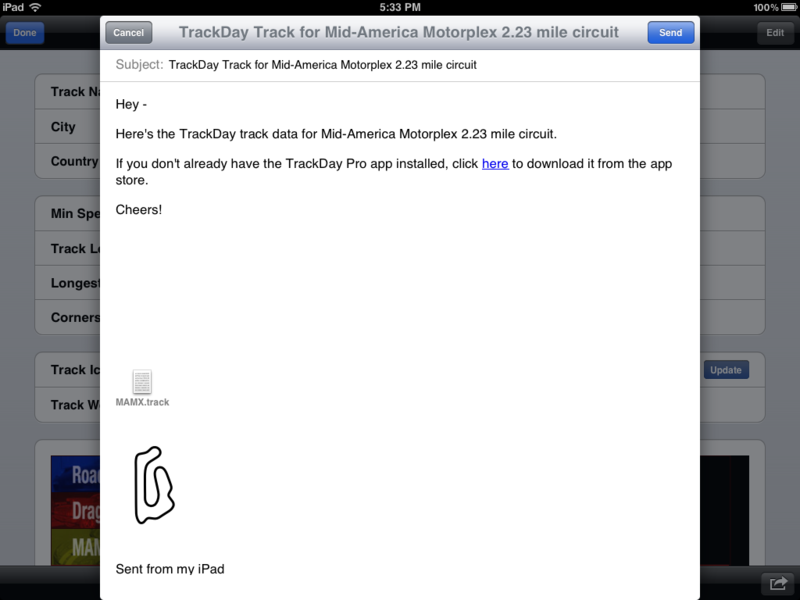 Send your track to us at trackday@ftlapps.com, and we’ll perfect the raceline for you and make the track available FREE for all TrackDay owners! 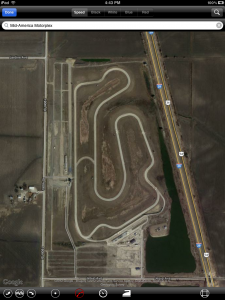 Also — let us know if you’d like credit for the track, and we’ll include your name in the title, e.g., “Mid-America Motorplex 2.23 mile circuit by James Toseland.” The same offer goes for companies that host track day events and the companies that own the tracks. In the 1.0 release, setting speeds for the raceline was an entirely manual process. But, we found that the actual process was very systematic: 1) reduce speeds in the turns to correspond to maximum speed in that radius, 2) accelerate at 10 mph/s out of the turn, decelerate at 20 mph/s into the turn. 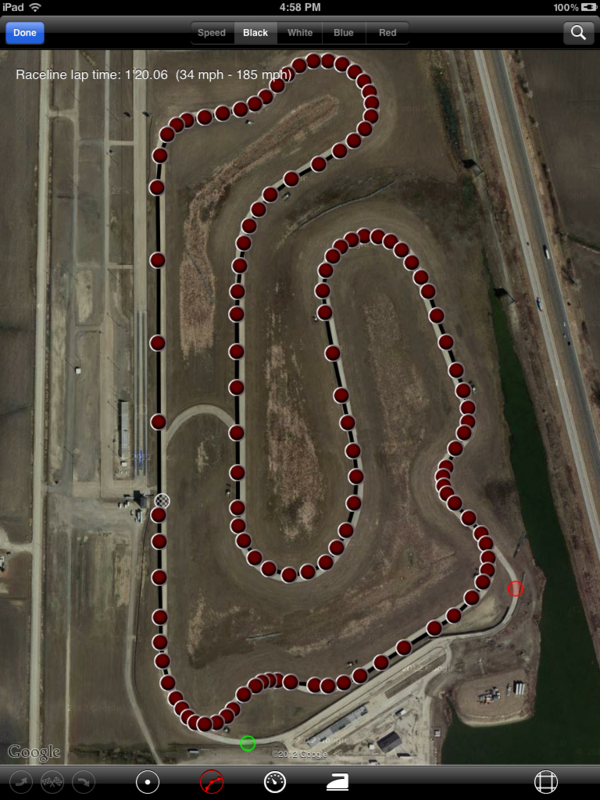 With a bit of smoothing on the acceleration out of the turn and trail-braking into the turn, we were able to manually produce raceline speeds that were an exact match for the best lap times on tracks around the world. Now, with the maximum speed around the track already set by the “Speedometer” button, a touch of the “Iron” button in the 1.1 release automatically applies the same smoothing techniques. Each touch will smooth the speeds a bit further. Typically, the sixth or seventh touch will produce the finished result: The optimal raceline speeds, assuming the specified path with 1G maximum lateral acceleration through the turns, 10 mph/s acceleration, and 20 mph/s deceleration. Try it! Now you have a completed track, send it to us! 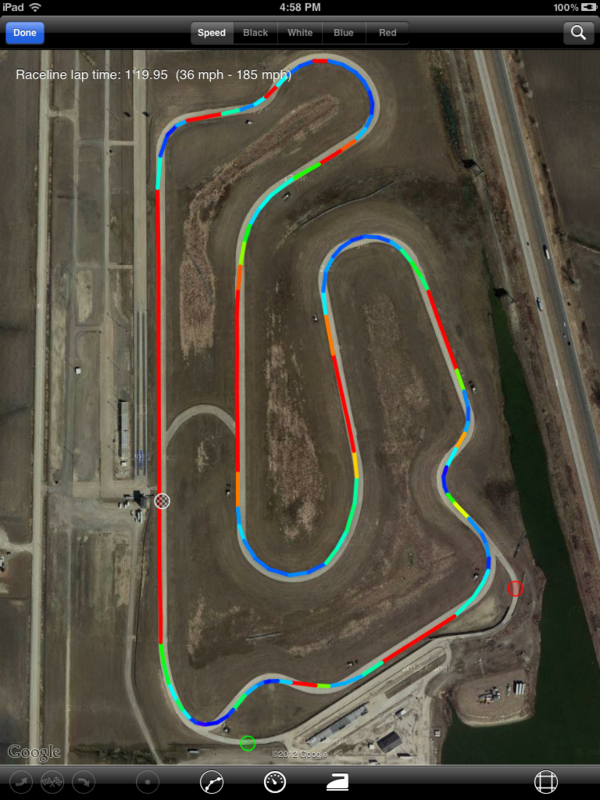 We’ll share it with the rest of the TrackDay community, give you credit for the track map if you like, and best of all, make it FREE for all TrackDay owners! 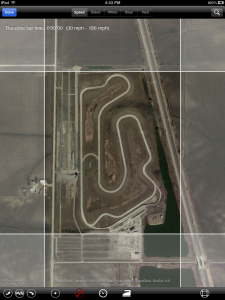 But, before you touch the “Action” button in the lower-right corner and select “Export This Track,” there’s one final step: Touch “Update” on the line titled “Track Icon Filename” and you’ll see the icon magically appear — that’s your raceline in miniature! Now, you’re ready to take the track out in the wild.